Sorry for the lack of updates this past week! I've been wanting to blog so much but have had zero time with all the hours I'm working at the moment. 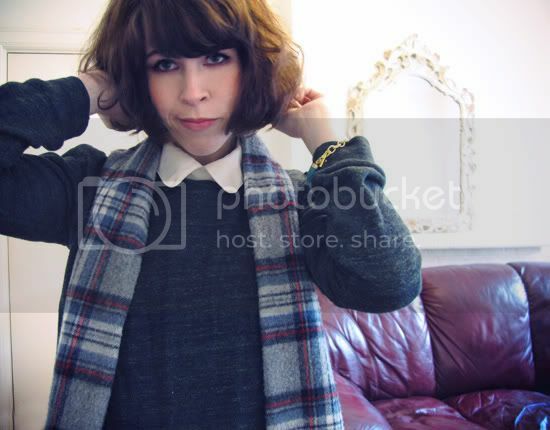 Here's an outfit from a little while ago, where I was quite possibly channeling a preppy Alexa Chung look. The rosette skirt was kindly gifted to me by Oh My Frock and I love mixing it with other interesting textures and materials. 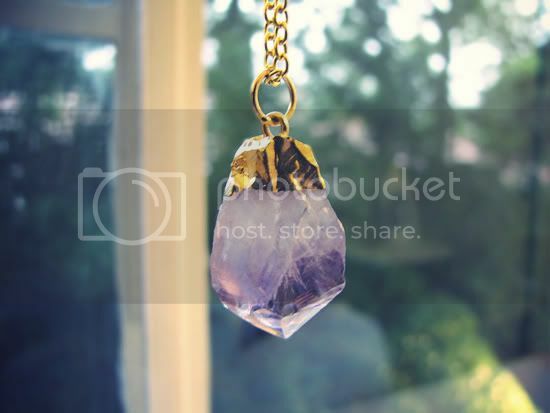 The bracelet I'm wearing is from Alice Wears Gold, who also sent me this gorgeous amethyst pendant (below). The Alice Wears Gold giveaway is open for a few more days, so enter here for a chance to win your choice of AWG jewellery! 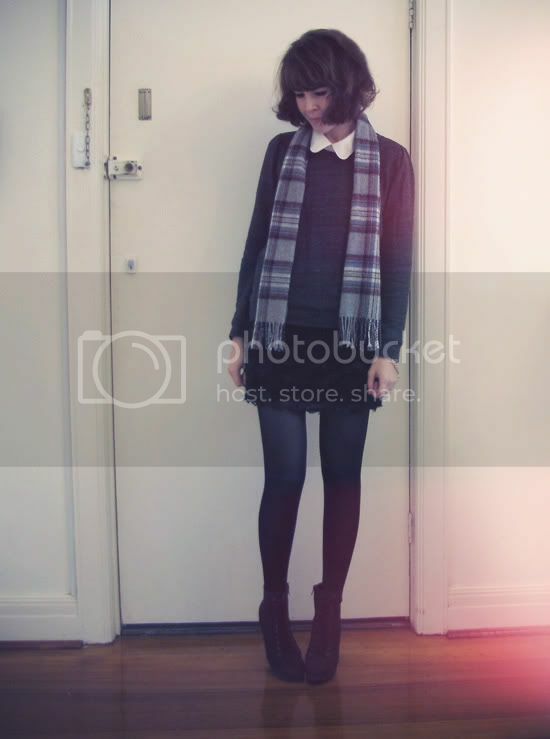 Love the British school-girl look of this outfit! Your hair works wonders with that plaid scarf. And the AWG jewellery is gorgeous. You're looking so beautiful as always!!! The rosette skirt is so chic! Love it how you paired it with the simple sweater and white shirt. Really cute hair. I love your hair too. I love it! Your skirt is so cute! Beautiful skirt! You look lovely! Love this whole outfit, but especially love that collar! What a perfect pairing with the short rosette skirt. So cute! I adore the boots! And the skirt! I'd definitely be doing the same by mix matching outfits with that skirt! Hi darling, I see you on Chicisimo, and i really love your style... I´m following you here now! Can you follow me too, please? If you like my blog, of couse!!! Hi girl! I'm Flavia, a blogger from Brazil. My blog has been quoted as a reference site for the self-styled "Fashiony.ru" (from Russia). I would love to invite you to visit me when you have a chance. You're beautiful, talented and has a wonderful job! Your style fascinates me me! Blogs I like to awaken inspiration, and when that happens, I become immediately follower. Congratulations for the beautiful work that presents here! It will be an honor to have you as my new follower. lovely outfit <3 i adore your skirt!! you look fantastic!! 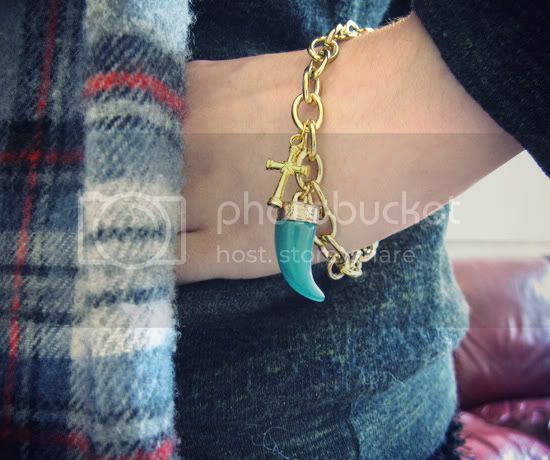 I like the bracelet. It's cool! Love the outfit and that rosette skirt is amazing! I love the AA silky tee, I have it in Black! Just wondering, is the white see-through? Can you wear it with, say, a black bra? Those Urban Outfitters boots are absolutely amazing! Thx for comment on our blog! your outfits make me excited to come back to winter in australia! 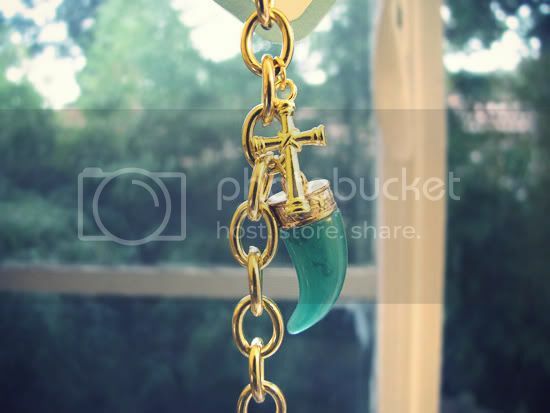 i love that crystal gem pendant bracelet :) how is forever new? It's definitely Alexa Chung-esque! I love the soft rounded collar of that top.